Are you not as healthy as you might be due to the politics of food? That statement may seem ridiculous, but it might be quite true for many if you are unable to access food you consider to be healthy. And for the American readers here, your food options are about to shrink even further due to politics. More and more people are rejecting factory farms, conventional mono-crop farming methods and GMO food and are instead seeking to contract directly with farmers that grow the organic produce and raise the pastured meat, poultry, dairy and eggs that they want . Big Food sees this trend as a threat to their monopoly, and Governments see it as a threat to food safety. Food is huge business. Everyone needs to eat, and the huge food companies want you to eat their food, so they are doing all the can to stop the growing interest in farm fresh, local food. Big Food has big pockets and they are influencing governments to pass regulations that will help them thrive. Provincial and State governments are prosecuting farmers that form food coops and herd shares in order to supply real food to people that want it, under the guise of not having a retail license, and then making it impossible for the farmers to get the license they require. (People want raw milk which the farmer provides, but the farmer is not able to get a license for raw milk for example). Farmers that are trying to preserve biodiversity are being prosecuted for such things as keeping “feral pigs”, even though this different breed of pig are not actually wild, but are on a farm. The Canadian Food Inspection Agency slaughtered all of Montana Jones’ very rare heritage sheep despite lab tests showing her animals did not have scrapie. Autopsies afterwards also verified that her sheep were healthy. 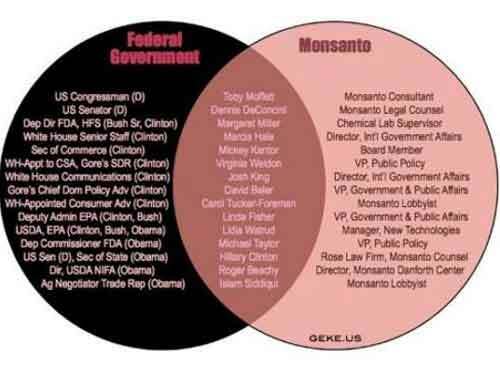 Over 97% of the population wants GMO food to be labeled, and for years Governments have done nothing about that fact, largely because of the overlap between directors of companies like Monsanto and the US Federal Government. Only now are things beginning to change at the State level. 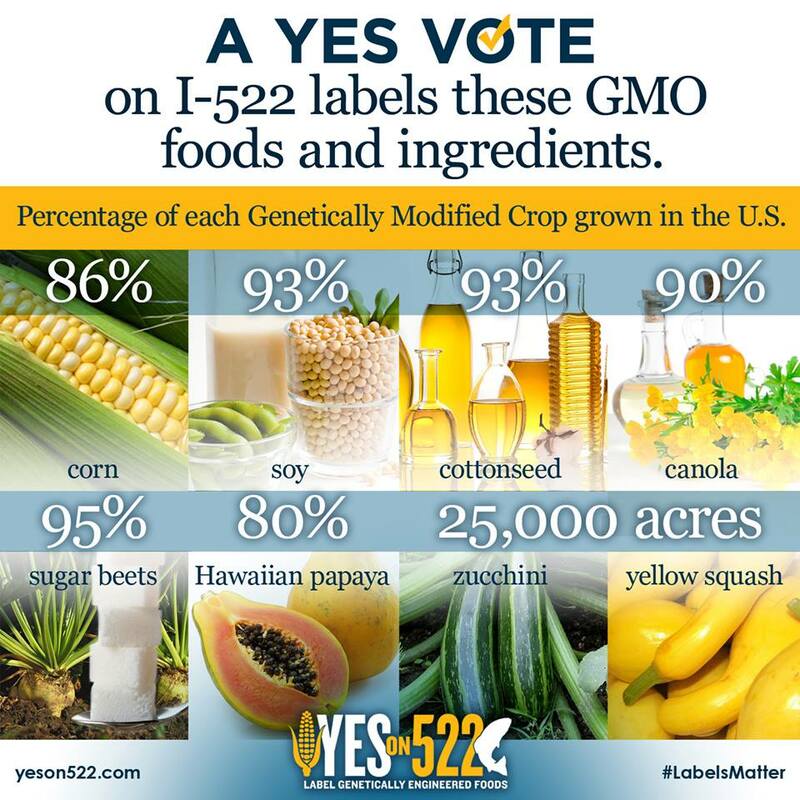 Big Food is putting millions and millions of dollars into the campaign to defeat Proposition 522 in Washington State, that would require food that contains genetically modified ingredients to be labelled. Big Food won in California by a very narrow margin, defeating that State’s effort to label GMO food. The Big Food campaign suggests that labelling will increase the cost of food, but these same companies supply GMO labelled and GMO-free food to 64 other countries in the world so it would not be that hard for them. 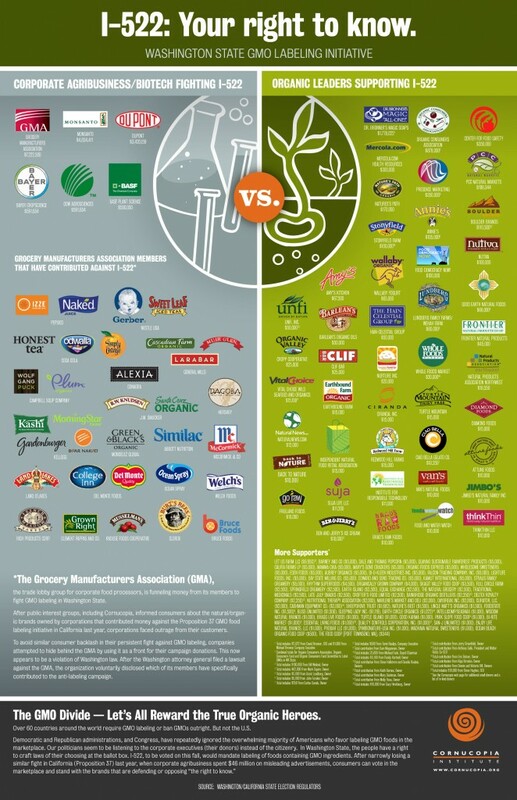 If GMO food is so safe, why are those companies so afraid of letting consumers know what is in the food? Are you okay with being experimented on without your knowledge or consent? Why is the GMO issue not being discussed regularly by the mainstream media? Why is it that only after the advent of social media that the issue of GMO food-labeling is suddenly on the radar? Governments are stopping people from growing food in their front yards. They are requiring permits for kids that set up lemonade stands. They are stopping people from having potluck community events. Food Coops are being raided at gun-point by SWAT teams. It is way over the top! Rawesome Food Coop in California a few years ago is a good example. Federal agents in full army combat gear were pointing their guns at people in tank tops and flip flops running the till. They confiscated the raw milk in the fridge, and jailed the owners. And this despite the fact that raw milk is legal in California, and can be purchased in grocery stores. Now in the US, FDA is implementing the Food Safety Modernization Act, which will probably result in many of the country’s safest farms being put out of business. 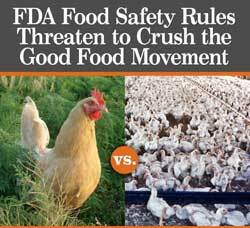 For example, in an effort to control salmonella, the new regulations will make it next to impossible for small farmers to have outdoor flocks of chickens, which research shows is far safer than indoor caged chickens. Funny they are trying to do this in the middle of a chicken salmonella outbreak from Foster Farms, a huge factory farm that has sickened 278 people in 18 States! The new regulations unfortunately do nothing to address the real problem with respect to food-borne illness – sick animals living in the filth of factory farms. Check out this W5 video exposing the horrific conditions and abuse of factory farms. Because the animals are held in such crowded, filthy conditions, antibiotics are part of the feed in the futile attempt to keep the animals healthy. The rise of antibiotic resistance that is affecting our hospitals is the direct result. Some believe we are now entering a world where antibiotics will no longer work, and people will once again regularly die of infections. If the farms that provide the healthy food are out of business, US citizens will have no option but to eat the unhealthy stuff. Big Agribusiness and Big Food are using the Government “food safety” regulations to control our food. There is a double standard when it comes to food safety – one for the factory farms, and another for the smaller farms trying to produce nutrient-dense food. So, the question begs. Is this okay with you? Do you care enough about your health and wellbeing to do something to protect your health by protecting your food supply? Are you willing to help small farmers survive by going out of your way to seek their food out? Do you shop at farmer’s markets or participate in community-supported -agriculture programs? Do you refuse to buy conventionally-raised food from big agribusiness sold at your grocery store? Are you choosing to spend your money on food now or on medicine that may or may not work later? Is buying cheap food worth the consequence? What we choose to purchase will have a huge impact on our environment, food supply and the health that our kids and grandkids will inherit. Please choose wisely. This entry was posted in General, Industry Issues and tagged Canadian Food Inspection Agency, CFIA, FDA, GMO, Health Canada, I-522, Monsanto, organic farm, raw milk, small farms, Vreni Gurd, wellnesstips.ca on October 27, 2013 by local delicious. My farmer was found guilty of contempt of court this week for producing and delivering an illegal “hazardous substance” to me. The substance in question? Elicit drugs? Assault rifles? Anthrax or other deadly agent? No. The hazardous substance they are spending our tax dollars on preventing me from obtaining is raw milk. If my farmer continues to care for and milk my cows for me and give me the milk from my cows, he will be sent to jail. To me this seems like Orwellian joke. Who is the victim in this milk crime? Is this a crime that deserves a jail sentence? On the one hand Big Brother is trying to protect me from my milk, and on the other, Big Brother refuses to tell me which foods in the grocery store are genetically modified. I can buy ground beef, take it home and eat it raw but raw milk, which also comes from cows, is so dangerous it can’t be transported across town and given to me. So, what is the science with respect to raw milk? Is the government’s position warranted? Independent researcher Nadine Ijaz MSc recently presented “Raw Milk: Myths and Evidence” at the BC Center for Disease Control, examining the recent research on raw milk. Please watch her excellent presentation. What follows is a summary of the points Ms. Ijaz makes in her presentation, and I suggest that you watch the presentation to hear about each of these points in more detail. A surprise to raw milk enthusiasts, but this is a myth. There is no lactase in fresh milk. There are many enzymes and bacteria strains in milk, but at the present time there is no evidence to describe their role in human digestion. There is some evidence that the non-harmful lactic-acid bacterium may aid in keeping the bad bugs at bay. Currently there is very little evidence to examine these questions, and the existing evidence does not substantiate the claims. Those of us that are raw milk enthusiasts need to be careful that we do not spread unsubstantiated claims, as that reduces our credibility. To determine if a food is risky, we need to know the risk per serving, as well as the rates of sickness, hospitalizations and deaths, along with how risky the food is for immunologically susceptible people. Quantitative Microbial Risk Assessment (QMRA) is the gold standard for determining pathogenic risk. QMRA studies characterize the risk of a particular food as low, moderate or high. Recent QMRA studies for raw milk show that there is a LOW risk for illness / severe health outcome for E-Coli, Listeria, Staphylococcus and Campylobacter. We do not yet have a QMRA for salmonella. To confirm accuracy of QMRAs, outbreak data is used. There has not been a single case of Listeria sickness from raw milk in the last 40 years. 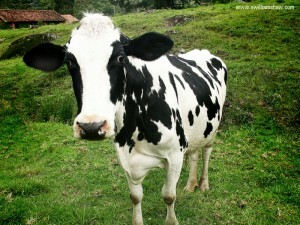 There has not been a single death from raw milk since 1998. One to 6% of foodborne illnesses are attributed to all dairy, raw and pasteurized combined. An extremely small percentage of illnesses and hospitalizations from food-borne illnesses are attributed to raw milk. The rate of hospitalization from raw milk was significantly lower than that from all other foods. Green leafy vegetables are the most frequent cause of foodborne illness representing 20 percent of all cases between 1998 and 2010. Yet the government has not named green leafy vegetables a hazardous substance. There is strong evidence that the consumption of raw milk has a protective effect on the development of asthma and allergies. Ten studies suggest this. The most recent study corroborating this evidence is the Gabriella study on 8000 school-aged children in Europe. Both blood samples and milk samples were taken, and study showed that there is an independent protective effect of raw farm milk on the development of asthma, allergy and hay fever by about half. That is HUGE! There is a suggestion that some of the whey proteins that are sensitive to heat and would be destroyed in pasteurization might be involved. We used to think that each vitamin or mineral works in isolation, and as long as they are in the diet, all will be well. Many studies suggest that there are not large differences in nutrients between pasteurized and raw milk. Now we know that vitamins do not work in isolation – vitamin D works with magnesium and calcium for example. Perhaps it is this synergistic action of the nutrients that might explain why even small nutrient changes can make big differences in how the milk works in our bodies. Vitamin A gets concentrated after pasteurization, whereas vitamins C, B and E are decreased. Perhaps the minor alteration in these ratios have major affects on how they work in our bodies. The recent Pasture Cohort Study of 2012, showed that pregnant mothers that drank raw milk had newborns with improved immunity and decreased cow-milk allergy. Infants drinking raw cow milk before the age of one had better immune gene expression. Risk/benefit analysis seems to pertain specifically to some of the most susceptible groups. There are 4 processes of industrial milk production that milk drinkers may object to – pasteurization, homogenization, vitamin D fortification, and grain/sillage/soy feeding practices. Some people are choosing raw milk in order to opt of the industrial process. This is the primary reason I personally prefer raw. Due to the precautionary principle it is reasonable to do so. Pasteurization or heat treatment has already been discussed. Homogenization is the process of putting the milk through a fine screen at high pressures to break up the fat globules so the fat won’t rise to the top. This is done to improve shelf life primarily. “Homogenization results in the most profound difference to the structure of the milk, and may result in altered health properties” Michalazki Janual 2006: 424. It affects the fat globule membrane and the organization of the proteins. It has been hypothesized that homogenization might be the reason that raw milk is protective for asthma and allergy. Vitamin D3 fortification: A recent 2012 reviewsuggests that vitamin D from the sun is quite different from synthetic vitamin D. There is another study that suggest that kids that are taking vitamin-D fortified milk have lower serum ferritin (iron) status. Individuals may use the precautionary principle and opt out of industrial milk for this reason. Contemporary feeding practices: Consumers are looking for grass-fed milk that have a more beneficial fatty-acid profile with higher omega 3 and CLA content. That people should choose raw milk. That public health should recommend that parents should give their babies and kids raw farm milk. The current evidence does however, support choice. “It is scientifically reasonable for people, including pregnant women and parents of young children to choose hygienically produced raw milk over industrially produced milk, whether or not they heat it themselves afterwards. It is not scientifically justifiable to prohibit people, including pregnant women or parents of young children from choosing to seek out an important food which may effectively prevent allergy and asthma.” Nadine Ijaz. So what is the role of public health enforcement? Limitations should be proportional to the risk posed by the by a given hazard. Enforcement should be consistent across foods (salad is far riskier than raw milk but is not deemed a hazardous substance). There should be a balancing of individual rights with public protection. In the case of our herd share, none of our milk goes into public commerce, so there is no risk at all to public safety. We need to focus on minimizing risk to reasonable levels. No other food has a zero hazard tolerance threshold. It is important to realize that pasteurization is no guarantee that the milk will be risk-free. The evidence no longer supports raw milk being designated as a health hazard. Instead governments should consider regulation, mitigation and education in light of the existing evidence. I sincerely hope that Nadine’s presentation gets viewed and shared. If you know any health reporters that can take on this story, please let them know. The war on raw milk and on farmers that are trying to feed a community that wants the food they provide, needs to end. Year after year we hear of farmers being prosecuted and forced out of business for providing food to those that want it. Most recently, Wisconsin is threatening to jail farmer Hershberger despite being acquitted of 3 of 4 charges related to his raw-milk coop. We as individuals should have the right to determine what we want to eat, whether that involves raw milk, or avoiding GMO food. We need help making this a national conversation. If you can help, please do! This entry was posted in Industry Issues and tagged raw milk, unpasteurized milk, Vreni Gurd, Wellness Tips on July 8, 2013 by local delicious. Okay, it’s crazy enough that raw milk is illegal both here and across the border in the US, but now there are stories surfacing that the US dairy industry wants to add sweeteners like aspartame to it, WITHOUT LABELLING. It’s a new level of insanity, in my books. On so many levels this is WRONG. When I spent time in central america I was treated to the beauty of drinking fresh, raw milk and suffered no ill effects whatsoever. In fact, I learned that milk in it’s raw form doesn’t rot, it simply changes form as time progresses. Once it’s no longer fresh and smooth enough to blend in your coffee without clumping, it becomes a texture similar to buttermilk and can be used to make oh-so-delicious pancakes, scones and other baked goods. And it doesn’t have that horrific rancid odour that rotten, processed milk has. The farm where I stayed had a few cows and we regularly had milk delivered to the house. I gotta say, there’s nothing so local as pouring milk in your coffee that is hand delivered by the farmer and is still warm. Local and delicious! This entry was posted in Industry Issues and tagged aspartame in milk, FDA, milk additives, raw milk, US dairy industry on March 14, 2013 by local delicious. My only personal experience with raw milk was years ago on a friends farm I visited in Manitoba. I was curious to try unpasturized milk, so she pointed me to a pitcher in the fridge and said, “Help yourself.” It was horrible, but I was too polite to say so. When she asked me later, I mentioned I hadn’t really cared for it, at which point she realized she’d pointed out the pitcher of sour milk she was saving for baking! On a purely logical level, it makes sense to me that if a farmer is feeding his or her family milk from their cows and is taking proper and more personalized care of them because the herd is small and s/he can, the milk will be fine. Statistically, that is the case. Now that we know more about beneficial bacteria in food than we did in the late 1800’s, when it became the norm, we know that pasteurization isn’t necessarily the holy grail of health and safety. Well, we do if we read beyond what is published by commercialized industry and the governments they lobby. Don’t get me wrong, it has it’s place. If you consider that back in the day, regular daily personal hygiene was sketchy (at best), you can see why sterilizing everything you put in your mouth seemed like such a good idea. Now that farming operations are so much cleaner, maybe it’s time to reconsider what we’re giving up by not allowing raw milk products — a variety of absolutely delicious cheeses, to start. I just think we should have a choice. For more on the topic, read Did You Want Your Milk Raw? in today’s The Tyee. This entry was posted in Food, Industry Issues and tagged milk, raw milk, unpasteurized milk on September 11, 2009 by local delicious. If we’re not willing to settle for junk living, we certainly shouldn’t settle for junk food.